The University of Monterrey (in Spanish: Universidad de Monterrey, acronym “UDEM”) is a private Roman Catholic institution of higher learning located in Monterrey, Mexico. UDEM is a higher-education institution of catholic inspiration, open to students and faculty of all creeds and backgrounds. 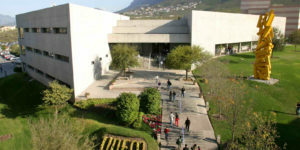 The Universidad de Monterrey is notable for offering a unique Whole-Person Education Plan to each student; in accordance with their personal characteristics and professional interests so that they can fulfill their maximum potential in an environment of high academic rigor and an international vision.